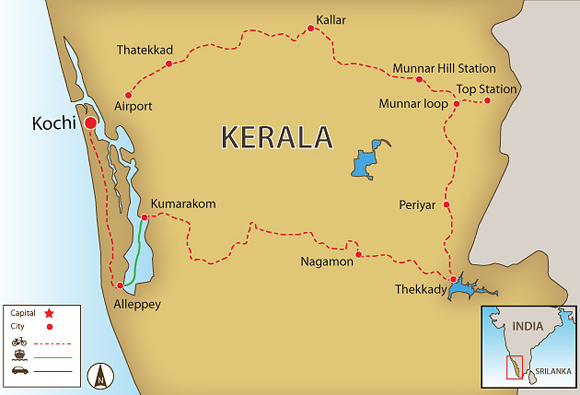 Kerala, a narrow Indian state sandwiched between the Arabian Sea and the mountainous Western Ghats, is known for its tropical greenery, backwaters, wildlife reserves, and tea and spice plantations. Along the way, you will be staying at beautiful heritage hotels, eco-lodges as well as a rice barge converted to a luxurious accommodation. We'll have our fill of ethnic and delicious food, seasoned by local spices. Then the climbing begins as we head up to areas known for its tea plantations and spice estates. Four wildlife parks are visited on this tour, where we will most likely be able see a herd of elephants. We then head towards Kumarakom from where we spend a relaxing afternoon plying the backwaters on a houseboat, where we'll also spend the night. From here it is a flat ride back to Kochi with time to explore this fascinating historic town. Its location near the equator combined with the sea breezes and cooler temperatures in the highlands makes it perfect for bicycling and lives up to its tagline–God's Own Country. This tour include a total ascent of 8,926 m and descent of 8,452 m.
Arrive in Kochi, a vibrant seaport town that is the perfect jumping off point for our exploration of Kerala. We ride into the countryside, passing a temple, crossing the Periyar River, where we may see elephants bathing. We head to the Thatekkad Bird Sanctuary and overnight in deluxe and unique house tents. Bird watchers rise early to see as many bird species as they can. Cycling from the hotel, we follow the Periyar River to the Valara forest reserve, as we gradually climb to our hotel. A morning climb takes us to Munnar Hill Station. There are lakes, reservoirs, forests, and several tea plantations carpeting the hillsides. The afternoon is free for exploring the town and bazaar. Ride to Top Station for panoramic views after climbing 500 m gradually through little traffic. Then there's the downhill. Today's stunning ride out of Munnar on an undulating country road goes through small villages with wonderful views to Kattapana town. We overnight at a tranquil resort set in a spice plantation. The ride to Periyar National Park, a rich bio-diversity spot and sanctuary for more than 40 tigers, is on small roads through deciduous forests all the way to our resort at the park’s edge. Have a free day to relax or go on one of the treks or boat safaris at the park. From the hotel, we descend on a scenic road through cardamom and tea estates, stopping to visit the Connemara Tea Factory. We overnight at an old plantation. Stunning views with a major descent makes this probably the best ride of the trip. We ride through rubber and spice plantations to India's second largest lake. The morning is free before we board our houseboat, a converted rice barge, for a splendid backwater cruise. We disembark at Alleppey and ride along an old canal road, passing his-toric buildings. We take the beach road north to Marari Beach for a sea-food lunch and relax by the sea. The afternoon ride ends at Fort Cochin. There is an optional morning cycle ride around old Cochin. The afternoon is free to relax before we meet up for our farewell dinner. Day 2 - Kochi - Thatekkad Ride 66km. +1,146m / -1,123m. Thanks to our excellent guide Shibu, we had a fabulous experience cycling in Kerala. His pride and passion for his country were evident and he ensured that we live a full, diverse and authentic experience. We thoroughly enjoyed our Kerala backroads cycling trip. The Indian food was spectacular, the sites were exceptional, especially all the tea plantations. The scenery is ever changing as we start cycling from the outskirts of Kochi and then climb the slopes of the Western Ghats, entering tea and spice country. We ride 544 km in 10 days of riding, but this tour is entirely on paved roads, so the distances are not too strenuous. We designed the route to take in the best of Kerala’s culture, countryside, and wildlife, all while enjoying an active holiday. You’ll ride from sea level to an altitude of 9521 m, but this is over many days, and though there will be some steep climbs, the pace is easy. There’ll be some exhilarating descents, including one that’s 22 km long! Suitability: You can expect some climbs with steep gradients for the first five days of this trip, then some undulating terrain towards the end. There are three days of longer distances, but they include major descents. The hills can be tackled by those with a moderate amount of fitness; however, being physically fit will, of course, be a huge asset, but as the tour is fully supported, the van is always close at hand if needed. Biking Conditions: This trip is on tarmac roads, and there is no technical riding involved. An air-conditioned support bus travels behind the group, so participants can cycle as much or as little as they like and still enjoy the same views as the rest of the group. We arrive in Kochi (formerly known as Cochin), a vibrant seaport town that is the perfect jumping off point for our exploration of Kerala. As the airport is more than an hour’s drive from the city centre, we stay near the airport, so we can ride straight from the hotel in the morning. After breakfast, we ride into the countryside, passing a temple, crossing the Periyar River, where, if we are lucky, we see elephants from a nearby camp bathing. We are on the slopes of the Western Ghats mountain range heading towards the Thatekkad Bird Sanctuary, home to rare birds like the crimson-throated barbet, black winged Kite, hornbill, ceylon frogmouth, rose-billed Roller, and blue-winged parakeet, to name but a few. We overnight in unique house tents that have peaceful views of the Periyar River. Bird watchers will want to rise early to see how many bird species they can check off before breakfast. Riding from the hotel, we follow the Periyar River. The gradually rising trail winds its way through rubber and pineapple plantations to the Valara forest reserve, passing waterfalls along the way. We continue our gradual climb towards our lunch stop at a local restaurant. The afternoon is still up, as we climb a total of 1314 m into the hills, branching off onto an old estate road to our plantation bungalow nestled amongst cardamom estates, the main crop at this elevation. Those with energy to burn can explore the rest of the valley and then freewheel it back to the bungalow. A 31-km morning climb of about 668 m in elevation takes us up to Munnar Hill Station. Located on the slopes of the Western Ghats at about 1,600 m above sea level, Munnar is situated at the confluence of three mountain streams -- Mudrapuzha, Nallathanni, and Kundala. There are lakes, reservoirs, forests, and several tea plantations carpeting the hillsides. After the hard work of climbing, we arrive in the early afternoon with enough free time, perhaps, to cycle 8 km to town if you want to take in the bazaar. Overlooking the town, Annamali peak at 1980 m is the highest mountain in Kerala and well worth the ride to Top Station (1,950 m) for the fine views over the town and neighbouring Tamil Nadu. The 681 m ascent is gradual with little traffic. The views are worth the effort. After lunch in a restaurant at the summit, there’s the reward of the downhill back! Today's ride is stunning, as we ride out of Munnar on an undulating country road that takes us through small villages with wonderful views of reservoirs and streams to Kattapana town. After lunch, it's just a short ride to our tranquil resort set among a plantation of a wide varieties of spices, such as cardamom, pepper, clove, nutmeg, ginger, and cinnamon. We’ll take a guided walk around the grounds to learn about the various spices. It is an easy morning ride to Periyar National Park. Snuggled in the Western Ghats, it is one of the world's richest bio-diversity spots, a fascinating natural wildlife sanctuary with more than 40 tigers in residence and many elephant herds. We ride on small roads through deciduous forests and try to catch glimpses of some of the native animals on our way to our resort at the edge of the park. For those who like to shop, there are a few curio shops and art galleries in this hip little town. For the free day, relax or go on one of trek or boat safaris to Periyar Park (please book in advance with your guide). Centred around a man-made reservoir, it is possible to see wildlife all year round at the park, although the best time is during the dry season, March to May, when herds of elephants come to the lake to graze by the shore. If you are very lucky, you may even see leopards or tigers coming down to quench their thirst. The park is rated as one of the best wildlife sanctuaries in India for wildlife photography and for bird and tiger watching. Riding from the hotel, we descend through cardamom and tea estates, stopping to visit the Connemara Tea Factory on the way to Kuttikanam, if tickets are available. This is a very picturesque road, and great views abound. We take a break from the saddle for a traditional lunch at Kuttikanam. After lunch, we continue our undulating ride out of the tea growing area, with a couple of challenging hills, along one of the most scenic roads in Kerala. Probably the best ride of the trip, simply stunning views combined with a 22-km descent greet our ride. We travel through rubber and spice plantations as we head to Kottayam, known as the Syrian Christian heartland of Kerala. Here, grand churches dot the landscape, and we break for lunch at Palai to visit St. Thomas Church. Its whitewashed facade and distinct guild ceiling, pre-dates its Portuguese renovation. Relax at our luxury hotel on the shore of India’s second largest lake and enjoy the surroundings. The morning is free for relaxing and enjoying the lake view or for an optional visit to the nearby Kumarakom bird sanctuary. Mid-morning, we board our houseboat for a splendid backwater cruise. The houseboats, converted rice barges, come with a captain, cook and crew; we just sit back, sip long drinks, and watch the world go by. 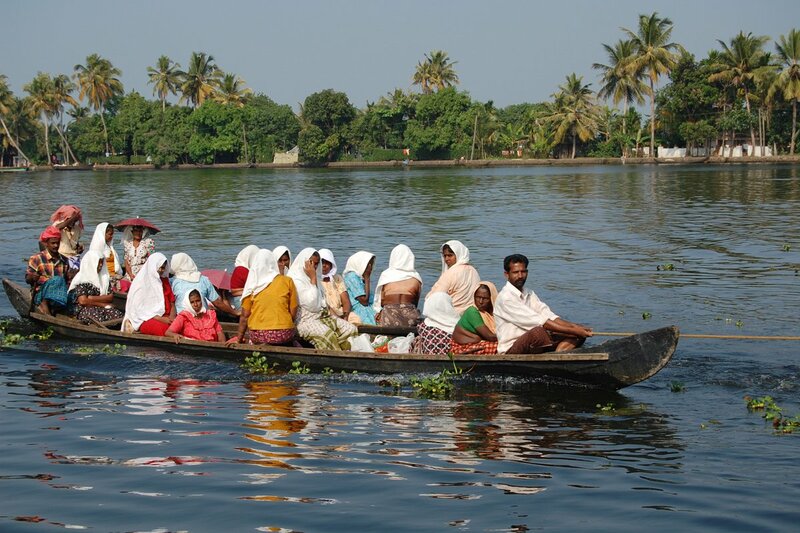 Mid-morning, we disembark at Alleppey, which is nicknamed the “Venice of the East” for its intricate canal network. Riding along the old canal road, we view some historic buildings and see why it remains the centre for Coir carpets, made from coconut husks, and prawn farming. Taking the beach road north, our ride ends at Fort Cochin and our boutique hotel. You can choose an optional morning cycle ride around the back streets of old Cochin, taking in all the major sights of Fort Cochin and Jew Town, before ending at Chinese Fishing Nets, a stone’s throws from our hotel. With a rich background influenced by the Arabs, British, Chinese, Dutch, and Portuguese, there is much to explore by bike, from the bazaars and the old harbour area of the town to the Dutch Palace, Santa Cruz Basilica, Vasco House, or the synagogue, built in 1568 for the Jewish members of Cochin's trading communities, adorned with hand-painted tiles from China and elegant Belgian chandeliers. The afternoon is free to relax at the hotel, poke around the antique and curio shops, or, if you prefer museums, the Museum of Kerala History, Gallery of Contemporary Art, Hill Palace Museum, or Chaithram Art Gallery. And, of course, there are an abundance of shopping and eating opportunities. But save room for our farewell dinner. We go our separate ways for onward travel or to explore more of incredible India. Because some people can't imagine going on a trip without their own beloved bicycle, we do not provide them as part of this tour. However, you can hire bikes locally for the price listed in the tour pricing section. The bikes are well-known makes of hybrid or mountain bikes with lightweight alloy frames, 24- to 27-speed gearing, v-brakes, and Shimano components and front suspension. If you bring your own bike, please make sure it is a mountain bike, preferably with front suspension, in good mechanical order.